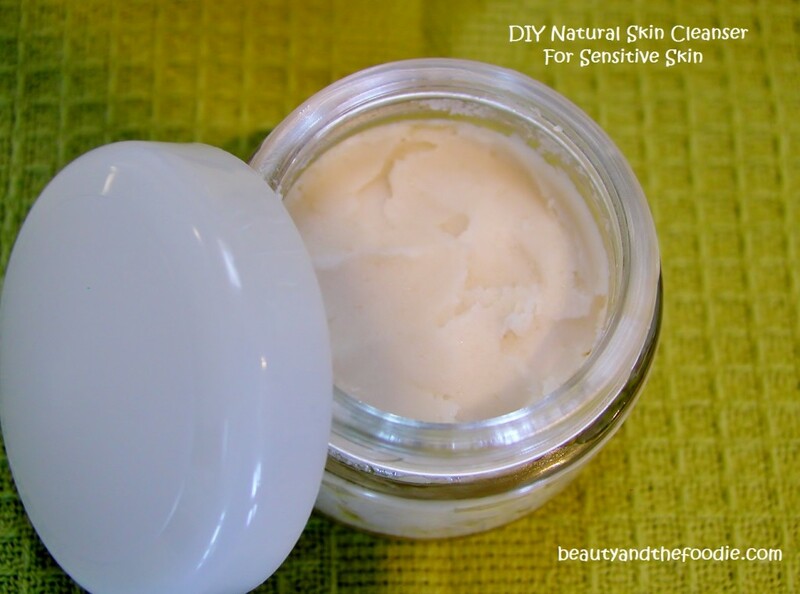 I finally made a natural skin cleanser that my hyper sensitive skin loves!! My skin is super delicate and sensitive. I can barely use anything on it without a reaction. But I have been using this for 2 weeks without any rashes or break outs. It just leaves me with soft happy skin. It removes make up, moisturizes, cleanses, and gently exfoliates dead skin cells. I also found a bonus use for this cleanser as well. I used it as a gentle body scrub, and those dry bumps on the backs of my arms ( keratosis pilaris) have gone away. Also the razor bumps on my legs have diminished. Leaves skin really soft and moisturized too. Easy and inexpensive to make. 3 Tbsp Organic Extra virgin Coconut oil ( Removes make up moisturizes with anti-aging properties), where to buy coconut oil. Put Coconut oil in a small bowl and stir with a spoon, if it is really hard then warm spoon under hot water, dry spoon, and stir oil with warm spoon until creamy ( not liquid). Add Tsp Honey and stir in well. Add baking Soda and stir in very well. Spoon into clean container with lid. No worries if if hardens, it will melt when applied to skin from your body heat. Use a small spatula ( found in make up section at drug store) or tiny spoon to scoop out a small amount ( pea size). apply to face and neck, and move fingers in circles around face to exfoliate. Let set on face for a minute to draw out toxins. Rinse and remove with warm water and a wash cloth. There may be some oil residue left, but it absorbs quickly, and goes away as soon as you pat dry with clean dry towel. You may not need a moisturizer at all after this, but if you do, then just a super tiny amount of plain coconut oil works well. I’m super excited to try this as I’ve never been able to use anything but water to clean my face. Now that I’m approaching middle age, I find my skin needs a little extra care. I’m worried though that your post sounds like your face may be a little oily afterwards? With naturally oily skin, I worry about this. Should I? Hi Kristin, I have combination skin (oily in the T zone and dry on the cheeks). It does leave your face slightly moisturized but no greasy. You can rinse extra and pat dry to absorb any residual oils. DIY cleanser is great because you know exactly what’s in it. I’ve been using this combo for a while and it works fantastically. I definitely use more honey than coconut oil. I was wondering if you had any face lotion recipes? All the fancy expensive ones give me acne or hives. Thank you, Aspen. I still use it too. I emailed you an update. I can’t wait to try your recipe. For the past several years, I’ve been using olive oil (sometimes with lavender or frankincense EO added) or coconut oil alone to wash my face because everything else seems to aggravate my dry, mature, sensitive skin. I suffered for years before finding this oil solution. However, lately I’ve wanted to do exfoliating but was weary to try it. Your facial wash fits the bill. Finally, could you also send the recipe for your facial serum, please? Thanks. Thanks for mentioning this helped with your keratosis pilaris! I have the same condition and have wondered if there was anything that could help the bumps go down. It’s a bonus it’s so easy and natural! You’re welcome, Karen. Also removing my food allergies from my diet helped with that as well! Hi Stacey. I have just come across your recipe and really want to try it. My skin at the minute is exceptionally dry, dhydrated, oily on t zone. A mess basically. I can’t work out if it’s my pregnancy or my age catching up. You mention in you post in the instructions to Rinse and remove with warm water and a wash cloth. Does that mean you rinse your face first with water and THEN move on to use a wash cloth? Or do you just mean remove with warm water and a wash cloth? I’m a little confused on how to remove it. I really hope this post is still working as I know it’s many years on since published… Thank you so much in advance. Claire, yes it still works! Use warm water and a washcloth to rinse off gently (no scrubbing). Would it be possible to replace the honey with a vegan substitute? Maybe aloë vera gel? I’m very big on animal welfare and I’ve committed to using vegan beauty products only. Could you let me know if this would work? If not, do you have any other vegan options instead of the honey? Thanks for sharing this, by the way! I’m so excited to try it. No worries, Jade, I used to be vegan before all my ridiculous food allergies. You can leave out the honey and just use the coconut oil and baking soda. Aloe might do nicely in this, but I have not tried it, but I can’t see it hurting anything. Thank you Stacey for this. I have very sensitive acne prone skin and have been using Proactiv for a long time. I still break out and have blackheads etc, Also I am afraid too much of proactiv might mess me in the long run. I have been trying some DIY. Will give this a try though I will probably substitute the baking soda with oats (Very good for sensitive skin). Can you kindly email me your face serum? Hi Stacey I tried using organic coconut oil.. and 1 drop of olive oil ..manuka honey ..and baking soda..Do you think that will be okay. I’m very sensitive just about anything will break me out.. from what I eat to what I drink I even tried the exposed skin care which supposedly is the best and nothing works . Hi Maria, it should be fine, but if not, try mostly honey and a little bit of coconut oil and baking soda. This is the only cleanser I use now. Almost everything makes my skin freak out, lol. I use it in the shower, and my face doesn’t feel horribly tight and dry afterwards like it used to. It’s not perfect, but overall, my skin looks better and feels so much better. Thanks for sharing, Stacey! Thank you, Claire. I’m happy it is working well for you. I use a higher amount of honey in mine now as well. When you mix this…how long is any unused portion good for? (like if you just keep it in a tupperware container).I only mixed hem oil, honey, and baking soda (no coconut oil as that is highly comedogenic) thanks! What is the expiration date on the oil you used? When I used coconut oil by itself (oil cleansing), it would make me break out, but when I added the honey and baking soda, my skin cleared up. Thank you for sharing. I can’t believe how much dead skin this took off! My skin is so smooth and soft. I use it on my whole body once a week and my face everyday. Thank you for trying the skin cleanser Courtney 🙂 I use it as a body wash too! Stacy this stuff is wonderful. I have very sensitive (and dry) skin that reacts with anything I use on my face. when I sweat everything on my face turns into a chemical burn, this magic concoction not only makes myface feel great but no burn!! I need to know tho..how well does this keep? Can I make a large batch or no??? Thank you so much for your kind words, Susan. This concoction has saved my skin too! I have the same kind of sensitive skin. It overreacts to almost everything. I’m very familiar with that chemical burn reaction you speak of. It keeps for as long as the expiration date of the coconut oil used. Should be kept at a cool temperature. I keep it in the fridge if the temperature inside is hot. You could make enough for a couple months supply. What is this facial scrub I’m reading about? Would I need this scrub to help clear the patches I have on my face? Unfortunately , I constantly experience acne as I have sensitive and oily skin so I appreciate your sharing and hope it helps me feel as beautiful as others say I am ! One question: what is this facial scrub? Should I be using it? Stephanie, The cleanser has a little baking soda in it which acts as a very mild scrub. I love this natural idea !!! I just made it and hope it works ! I’ve tried so many different methods to get rid of my acne but I never look as beautiful as I’m told I am 🙁 . Which I would appreciate so much if you could help me with !!!!! I have a question though .. what is this face serum I’ve noticed others are talking about? Do I need that? I have oily and sensitive skin so I don’t want to apply too much … I plan to use this cleanser every night . Hi, I have seb derm and rosacea so I have oily, flaky, sensitive skin with (big) pores, white and black heads and hormonal acne.. Do you happen to know if this can help me? Is it safe to use this daily? And I only have cold pressed organic coconut oil, will that be fine? Hi Katrin, It is worth a try and it is safe to use daily. If you want you could use more honey and less coconut oil in your mixture if you feel it is a better option for your skin. Yes, cold pressed coconut oil works fine. I really like this cleanser. I have been using it about a year and my skin looks great. I live in a cooler climate (Michigan) so for the winter I replaced 1 teaspoon of the coconut oil with another oil (jojoba, argon, sweet almond). It made it perfectly creamy when our house was a little cooler. Now that its warming up I’ll use the full coconut oil. Thanks! Sahir, I will email you. Would it be possible to email the serum recipe too? I love this cleanser and trust any recommendations you make. Stacey, would you email your face serum as well please. Hi! Could you please share your serum with me as well? Also, I don’t think my face like coconut oil. Grapeseed has been a better fit. Does the consistency or expevted effectiveness of the scrub change much if I sub something else in for the coconut oil? Thank you so much! I feel exactly like you because my skin doesn’t go well with essential oils or toners, especially facial wipes, they make me break out so bad. So I just made this and I really hope it works *fingers crossed*! Hi Amber, I hope this works out for you. You can always adjust the honey to coconut oil ratio if needed. Add more honey and less coconut oil if needed. Is it okay to add a few drops of lavender/tea tree essential oil to this recipe? Hi Yang, You could add a drop of those to it, but be careful, I find that adding the eo’s even in small amounts can irritate my eye area. I don’t know if it is just my eyes area being more sensitive than others. Love your recipe! I did tweak it a little for my aging and dry skin by adding a little avocado oil and some essential oils. My skin now glows, my pores have gotten smaller and no more blackheads on my nose! Now I just need to make a bigger batch to use in the shower lol. Hi Norell, Thank you so much for trying the skin cleanser. Yes, feel free to add ingredients that your skin likes. I do that too. Sometimes I add a few drops rose-hip seed oil for by aging skin. I have an extreme oily super sensitive skin ,can I use this?? I mean is this suitable for this skin types? Apsara, I would think you could use it, but if you find it too oily for you, then use more honey and less oil in the mixture. Hi Stacy-do you have a new recipe that includes more honey to coconut oil ratio? I think I saw that you switched it up and added more honey to your initial recipe. I was just curious how much. Thanks! Yes Linsey, sometimes I make this with 2/3 honey to 1/3 coconut oil ratio. I have coconut oil that I bought from the baking isle of the grocery store, is this the same coconut oil that I would use for this or is there a different type? Also, when I measure the coconut oil I’m measuring it in a creamy solid state correct? I usually wash my face when I shower, would this be fine to use during showering? Finally, can I add any essential oils to this, if so are there any you recommend? Thank you! Hi Kayla, yes it the same oil as used in baking and cooking that is at the grocery store. You can measure in creamy solid form, but could also measure in liquid form as well. I usually rub on my face right before i step into the shower, and rinse off with a face towel while in the shower (just to keep it less messy for me in the shower). Some viewers do add essential oils in the smallest amount, but I don’t add it to mine because I use this on my eyes and face to remove powder or makeup, and some of the oils can irritate my eyes. But my skin and eyes are super sensitive. I do use essential oils in a face serum that I use after I cleanse and I don’t use it near my eyes, and it is fine. what is the face serum you use after you cleanse your face. I just made and use the face wash and so far I like the way it feels. I have oily and to normal skin, around the nose and forehead area seems to be more oily. I also want to tighten and lighten up my under eye area, any suggestions. Kimberly, I will email you my suggestions. Can you email me your serum suggestion as well? May I get your recipe for face serum? I use it twice a day, but you can use once a day also. Can this cleanser be put into an air pump bottle? Teresa, Probably not, as it gets solid when cool and liquid oil when climate is warm. I would think it would clog any pump when the oil gets solid. hi. i was wondering if i could use fractionated coconut oil ? Bernita, Yes you can use fractionated coconut oil, but I don’t think it will become solid and it will stay liquid. You may need to stir it before using it every time. How often should I use this recipe a day? Yang, once to twice a day. Depending on how often you cleanse your face. Would I be able to substitute the coconut oil for something else. I’m allergic to coconuts .. and EVERYTHING seems to have coconuts in them .. If you could help me out that would be awesome thank you!!! People have used jojoba oil in place of the coconut oil. I’m excited to try your recipe. Can I double or triple the recipe? 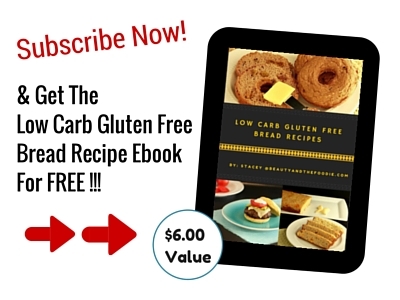 Hi, thank you so much for sharing this recipe i will definitely be trying this! I just have one question, what is the shelf life on this recipe? I think the shelf life would be the same as the experation date on the coconut oil your using. I use up mine in a month or a little less, so I have not had it go bad, as it runs out well before the coconut oil expires. I am excited to try this recipe but yours looks really solid. I live in Arizona so right now with triple digit heat the coconut oil stays liquid, even with the AC indoors. I was wondering if it would still combine and be manageable to use in its liquid state? Thanks in advance. It is harder to manage in the the liquid state. When I’m in warm to hot climates, I keep it in the fridge so it stays semi solid. I brought it to Hawaii with me, and it became liquid, so I kept it in the fridge while I was there, and it worked great. I had it in my luggage and double wrapped it in zipper bags in case in leaked out of the container, as I could imagine it getting all over my clothes, lol. I was going to just buy the ingredients and make it there, but strangely the only grocery store where we were at (in the country not the bigger city) did not have coconut oil, lol. So many coconuts and no oil or coconut flour! Omg! I just wanted to say thank you for this recipe. I used it last night before bed. My skin has never been so soft. And cleaned up so much in just one night! Hi, this recipe looks great and I intend to make it today. Wondering, is it ok to use this as an all over body wash as well? I SEEN UR RECIPE ON P/T & IM GOIN TO TRY IT TONIGHT. I HAVE A BIT OF ROSACEA ON MY CHIN & UPPER LIP AREA. IM NOT LOOKIN FOR IT TO TAKE IT AWAY BUT I HOPE IT HELPS IT SOME WHT. CANT WAIT TO TRY IT. & i also have very sensitive skin.hve tried many products but to no avil none wrked… sooooo here i go!!! thx for recipe hope it wrks!!! B, That is awesome to hear 🙂 Keep us posted. I was really skeptical to try this. But I’ve been using it for a month now and my skin still looks much better than it did before. I have super sensitive skin and get dry, red itchy patches from pretty much any product I use. The only thing I can use is Eminence organics, and only the stone crop face wash, not any other washs. While the Eminence face wash always worked well, it left my skin very dry. Now that I switched to you mix, my skin looks years younger because it’s so much more hydrated and less dry. I made my second batch this morning after running out now. Grace, it makes about 3 1/2 tbsps product. I keep saying I want to try DIY cleansers but I never seem to have all the ingredients for recipes – this time I do thank goodness! Also, it sounds like these ingredients are just right for me! Certainly, giving this a go! Can you not use the coconut oil? Or use a substitute? Grace, some viewers have used jojoba oil instead of coconut oil. Any other substitutes I could use? I really like rosehip seed oil, but that may be more difficult to find than jojoba oil. I believe that some viewers have used olive oil or squalene oil as well. coconut oil worked best for me though. Are you allerigic to it? I’m not allergic to coconut oil. I just don’t have any, and I really want to try this with something I have readily available. Thank you for the suggestions. Do you know if it helps with mild acne and redness? Grace, Everyone’s skin is different, but it has helped clear up my acne and redness completely. Hi,Can you use regular organic honey instead of raw honey or does it have to be raw honey? Yes you can use organic honey. HI wondering if I can add some Lavender and frankincense to this ? Candace, you can but be careful to add only the tiniest drop and test it first on a small patch of skin before using over your whole face. Essential oils are great but can be very strong, and some can irritate the eyes or skin. can I add some citrus fruit lemon pure juice and grapefruit pure juice and the last thing tea tree oil? Ash, you can try very small amounts of those ingredients in a small test area (behind your ear for instance) to see if they irritate your skin. Those are great ingredients but very strong and can be irritating to some skin types. So only add one in a tiny amount and test for a few days(3 days) before applying to entire face. What if I don’t have honey? Alexandra, honey is a key ingredient. You could try it without the honey, but honey makes a big difference for me in this recipe. 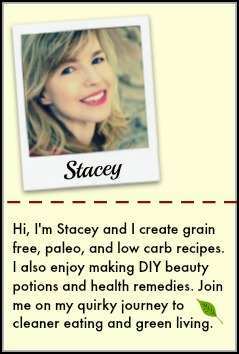 Hey Stacey I am an India can I use parachute coconut oil that i use for my hairs in this recipe or I shd use a separate one?? Mashihat, I’m not quite sure you should use that coconut oil, as it is a hair product, and it may not be for use on your skin. However I’m not sure what is in the hair oil. I would use the one for cooking, as that has only coconut oil in it. I think Parachute can be used. On the bottle it says it is edible, so it must be pure. Thanks for letting us know, as I am completely unfamiliar with parachute oil. Thanks for this DIY cleanser. I have sensitive skin so I thought of giving this a try. I don’t have honey as of the moment, can I use sugar instead? Jasmine, I’m sorry but it has to be raw or organic honey. Sugar does not have the same properties and would be better used in a scrub. Hey Stacy, I made the cleanse exactly how u said but the coconut oil in the jar is separat from raw honey and baking soda. What do I do to get it to look like the pic. Becky, it combines after it is warmed when first made, but does separate after sitting awhile when the weather is cold. I just stir the cleanser it a bit before using with a small spoon, if it separates a lot. A little separation is fine. Becky, I am so happy to hear that! I know what you mean, I am still amazed this has changed my skin, and wish I had discovered it sooner. I have spent an embarrassing amount of money on skin products over the many years trying to fix my skin. The best moisturizer is goat milk lotion! Hi Pepper, thanks for trying the recipe and the letting us know about the goat milk lotion. Do you know a good place to find this? I will try it, if I can find a source. hi! I just made a batch of this and am excited to use it in a bit. I started with the OCM nightly about 3 weeks ago and love it, but feel like I could use something to exfoliate as well. Is this a good option for an A.M. Cleanser? Andrea, I use it in the morning and at bed time. Hello and thank you for sharing this recipe to a happy sensitive face of mine.. I have one question would you say adding a few drops of tea tree oil is a bad thing or can it be beneficial..
Hi, I was wondering why you added baking soda if this was intended for sensitive skin. I often hear baking soda is bad for the face (even in small amounts) because it messes with our PH. Emm, I add the small amount of baking soda to lightly and gently exfoliate, but if your skin has issues with it, then you can omit it. I have the most sensitive and allergic skin of anyone I know, and this is the only cleanser I can use that does not irritate my skin. I am almost 50 years old, and I can’t use any store bought products, or dermatologist recommended products, or even most organic products. I am am not a dermatologist or doctor, I’m a cosmetologist who has been trying many different products (homemade & purchased) for decades. I am happy to report that I have been using this formula for over 3 years without issues. I finally have comfortable, happy, clear skin. It may not work for everyone as different skin types can vary, but I’m sharing it in hopes that it will help others as much as it has helped me. Oh thanks for the reply I have not tried it yet I was just scared away by something I read online. I also have sensitive skin, not super sensitive though. I used baking soda on my face once for a bug bite but have never scrubbed with it. I think I might try this because I love my cleanser but have yet to ever find a decent, (gentle) exfoliating product. Thank you! how about the expiry date? How long will it last? Norlidanorlie, It depends on the expiration date on the coconut oil you are using in the recipe. It expires when the oil expires. Hilda, I do use it on the eye area without any issues. Thanks so much Giselle. 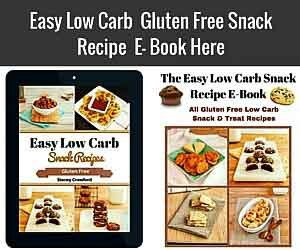 I am so happy you have had success with this recipe, and shared your results with us. I did not experience the detox phase because I had started using this recipe after using the oil cleansing method for awhile. So I had already went through some breakouts from that. Which is why I decided to start putting other ingredients into the coconut oil to help my skin during the detox phase & I stumbled on this combination my skin loves. Love this cleanser as it’s so easy to make. After having Rosacea I have found it difficult to find any product I do not react too. Recently I have started to make a few DIY products with great success. Rose Hip oil also helps to sooth the face I generally put water on my face first then add this cleanser at night and in the morning again put water on my face and add a drap of Rose hip oil to my hand and apply to face. Very happy with results. Thanks again for this recipe. How many times a day do you use this? Is it good for dry skin? Chelsea, 1 to 2 times a day depending on what is your routine. The recipe sounds simple enough. However, I just made a batch and I seem to have problems getting the honey to blend. I read through all of the recent comments and have not seen any posts concerning how theirs turned out. Do you have any suggestions for what I may have done wrong? Or, is that how it should be? I used the three ingredients suggested. By the way thank you for the recipe and research, as I have very sensitive skin and nothing has ever worked for me. I am praying this will! I just wanted to say I have been using this for months now and it is a godsend! I use to spend 40-50 dollars a bottle on skincare from a dermatologist office and this cleanser blows all of them out of the water. Of course it will work differently for different people but I don’t see myself changing it anytime soon! Thank you! Angela, you can leave out the honey, but I would be careful adding any essential oils as some viewers have experienced irritation and burning when adding essential oils to this. I have not tried it as I am allergic to some essential oils. I know, total bummer. Coconut oil clogs pores after a while and you end up with those ugly whiteheads all over your face. If that happens, switch to oilve or almond oil. Those are non-comedogenic and won’t clog your pores while moisturizing. Hi Angie, the cleanser is rinsed off with water so it does not leave a heavy coating of oil on the skin. I think the baking soda in it also helps remove it too. But if you are sensitive to the coconut oil, then there are other oils that could work better for you. I heard jojoba oil is excellent choice too. Hello, Can you tell me how many times a day you recommend i do this? I just wondering how many times a day you recommend doing this? Also do you use any toners, or is a toner even necessary at all? Sharee, I don’t use toners, as my skin does not do well with them. I use this twice a day (morning and before bed). 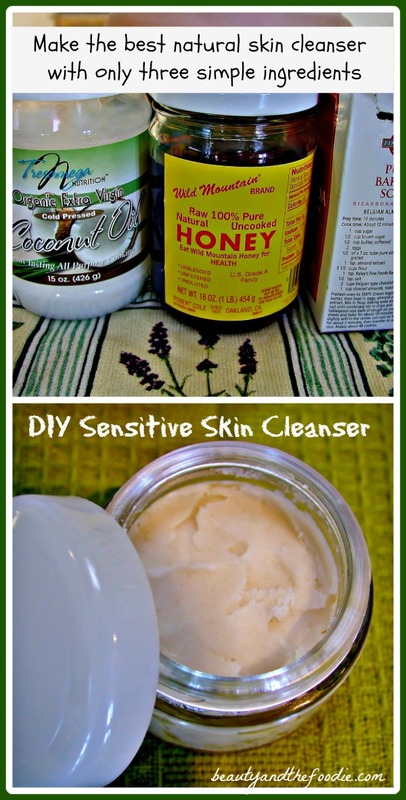 I love this recipe cuz my skin is soooo sensitive like yours. However, i have oily skin with pimples,. i wonder my skin loves this recipe or not. What type of your skin? Oily? combination? dry? Linda, my skin is combination skin with oily t zone and dry cheek areas. I have acne prone skin as well. I am really happy to have found this recipie and am really looking forward to trying it out myself but im am curious as to if you can store the cleanser in the fridge or in your restroom for further use. If so how long can you store this cleanser ? Beatrice, You can store it in your restroom at room temperature, unless you live in a very hot climate, then you might want to keep in the fridge. Not because of spoiling, but because it will turn to liquid and be a little messy. Since all the ingredients have a fairly long shelf life, you can keep it on your bathroom counter for at least 3 months or longer. I only had to keep it in the fridge while in Hawaii, as it melted there. It is mild weather where I live. If it gets 90 F or above in your home then keep it in the fridge. Rhonda, Thanks for sharing your results and very helpful information. You are correct, for some people there may be a purging stage depending on what kind of products you were using before. I was already using natural oil based products, so I did not experience that. But I have in the past, when switching products. Could you add lemon to it and would this be beneficial? Nalani, you could add a tiny bit of lemon for fading darker spots, but use very little as it can be irritating. I just had a question. I’ve read that baking soda is bad for the ph of the skin and while short term use it can be a good exfoliater, that it can cause additional issues. I was wonder, since you stated that the baking soda draws impurities out, could I substitute a clay instead? Melissa, I have not had any issues with the baking soda, but Clay would be a great sub for the baking soda. Sometimes I do throw in some bentonite clay and it is a great option too. Thanks for sharing this recipe, Stacey! 1. I don’t use honey for ethical reasons. Can you suggest a substitute? 2. When I used org extra-virgin coconut oil for my chapped lips as recommended by many people, it dried them up more! After researching a bit, I found articles that said coconut oil can exacerbate dry skin. Also, when I tried the olive oil cleansing method, I got whitehead-like bumps. I still want to use natural makeup cleansers, so wanted to check if you’ve experienced this at all. And/or which other oil might be suitable in this recipe for dry skin. Hi Jenna, you can totally leave out the honey and you would not have to replace it with anything. If the coconut oil is drying on your skin, then perhaps Jojoba oil would be a better option. I have of heard coconut can be drying for some skin types, but have not had that experience. I have heard the jojoba oil is great for very dry skin. Just one question…Do you still use it??? Preiyanka, I am happy you like it. Yes, I am still using it. I do try new products, but always go back to using this as nothing has done better for my skin. Thank you Preiyanka, I was getting eczema and possibly cosmetic dermatitis on my face also. Probably from trying too many different products on my skin. I use this now with no issues and I am very careful about anything new I try on my face, including make-up as it can cause a rash too. I am still using it and loving! My eczema and I don’t have to use any other face products except moisturiser! Preiyanka, That is great to hear!! 🙂 Thanks for taking the time to let us know. 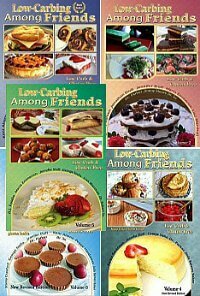 I just found your site and I am really excited to try your recipes! I found you on Pinterest too:) Thanks a million for giving us quality information that shows you know what you’re talking about. April, thanks for your kind words and vote of confidence. Cindy, thank for letting me know how it is working out for you. Very pleased it is doing well for you too. I was hoping other people’s skin would like it as much as mine does. I have a silly question, do you wet your face before you put the cream on? Thanks! Krysta, that is not silly at all. You can actually do either. I don’t wet it first, but you can. hi I love this recipe but dose it remove make up ? As i don’t go a day with out any make up on but I really want to try natural ski care . Emily, it does remove my mineral makeup, but probably would not remove mascara or some of the long wearing foundations. Coconut oil is a FANTASTIC makeup remover 🙂 !! I recommend it to all my family and friends because its so good for your skin and it takes off even my waterproof mascara with ease! No scrubbing, and no red blotchy eyes! I have sensitive skin that often flares up from makeup and other moisturizers but my skin has reacted beautifully to the Lady Soma Renewal Serum. I use it under my makeup, to make it set better and NOT irritate my skin. I wash my face minimally now only using an apricot scrub and when i apply the Lady Soma serum, it feels even better. I have reduced breakouts and my new smooth skin that has encouraged me to wear makeup regularly again. Before this stuff, i didn’t wear more than some loose powder occasionally. Is this a cleanser that is good for everyday use, morning and night? I’m nervous to use coconut oil as a lot of people says it clogs their pores. Would jojoba oil be a good sub? Jenelle, I have not tried jojoba oil in this, but it is worth trying it. I think it may need to be stirred before each use as it most likely will not become a solid. If you try it, let us know your results. hey. My skin is VERY SENSITIVE and I break out and its also dry and flaky. so i cant really use any products. will this product work for me? and do you moisturize after you use this? should i use it morning and night? Christina, I would think it could work for you. I have super dry, sensitive,but acne prone skin too. I don’t always moisturize after this as it leaves a light moisture layer behind, but you can if you need extra. As long as you have a moisturizer that does not upset your skin. Okay so I can use it twice a day? (morning and night? As a cleanser)? and can I substitute the baking sofa with something else? Thank you!!! Christina, You can use it once or twice a day. And you can substitute the baking soda with a little healing clay or Dead Sea mud if you wish. I bought 100 pure coconut oil will that work as well. Also do you just wash your face with it then that’s it. I used to cleanse, use toner, acne medication, then moisturizer last. I started using it today so how long did you take for you before you started to see a overall difference and for acne to clear up. Do you have any diy quick treatment for when you have a breakout like overnight treatment. I have acne prone skin. So frustrated! I am going to give this a try. I read turmeric is good too so I may add some of that in? Thank you for sharing your experience. Cindy, I feel your pain. My skin is so problematic. I have heard that about turmeric too. It is worth trying, just add very little. What I like to use when I get a flare up is Aztec healing clay mixed with a little apple cider vinegar. I put that on any spots for a half hour or longer. Have not tried it overnight. It does help it heal quicker but not disappear. The Aztec healing clay, I get it on amazon, you could also add a tiny bit of it to the cleanser to help with acne. I add this in sometimes. I hope this helps your skin. Melanie, I do use daily in the morning and before bed time. HI i was just curious on if it was absolutely necessary to use raw honey instead of just basic store brand honey because I have the baking soda and coconut oil but i don’t have the raw honey I just have a store bought one! Tiffany, you can use regular honey. I just prefer raw honey. Hi Dear..I have very sensitive skin and I normally use baby oil for cleaning my face, but now I am going to try this recipe..I also have question that can I use baby oil instead of coconut oil?.. Tejashri, I think you could use that if you prefer. I know some have used olive oil instead too. Hi Stacey, I tried your recipe.. But as I said I tried it with baby oil and unfortunately the mixture was not uniform.. I mean honey and oil was not getting mixed properly. So I added little amount of aloe-vera gel and whipped using blender. It looked great. When I used it I found it little oily.. However as you said oil was absorbed after few minutes. My skin feels great.. However I would use coconut oil next time.. I guess pure coconut oil is best for our skin.. Thanks for the recipe..
Tejashri, thanks for letting me how the oil substitution went. I think the aloe gel is a nice addition, and using the blender is a great idea. Love this! I have struggled with acne and psoriasis for many years and nothing (I mean nothing) has worked. I’ve recently begun researching natural skin care, in hopes that it might help my worsening psoriasis, and have discovered the benefits of Coconut Oil for the first time. This recipe not only helped with my current skin problems, it also is starting to reduce the appearance of age-old acne scars. My acne is all but gone! I was very sceptical at first but now i love it and couldn’t imagine using anything else. I have shared it with my cousin who also struggles with problem skin. Thank you for posting this….I love, love, LOVE it. Bethany, thanks for your kind words and very happy it is working for you. Love this, and can’t wait to try it! Is this gentle enough to use daily? I’m thinking of using it every night in the shower. Keren, thank you for your enthusiasm! It is gentle enough to use daily, and the shower is where I use it as well. Hi! I really want to try this recipe but a lot of people commented saying they have dry skin. My skin is oily and very sensitive! Do you think this would work with my oilyness? Thanks! Hi Meagan, I have combination skin, but one person that commented said she used olive oil in place of coconut oil because she had oily skin. Which would be gentle as well. It won’t solidify and will have to be stirred a bit before using as is separates. Meagan, I also have oily skin and it works great for me. Especially if you can l paur it with a natural lemon juice toner. Well, my boyfriends mum and I both have terribly sensitive skin. After trying product after product and even suffering chemical burn from a facial cleanser, I think it’s safe to say this is Great. My face feels amazing and fresh, and both mine and my mother in laws faces are in such a healthy state 🙂 thank you for sharing this recipe. Carla, I too have had burns from store bought skin products and hives. I am so happy it helped you and your family. It took me so long to make something that my skin could tolerate. I was hoping that it would work well for others with unltra-sensitive skin like mine. Thank you for taking the time to leave feedback and comment. umm.. can olive oil be used instead of coconut oil.. I’ve heard its great? Tanu, you could use olive oil, but it will not solidify and may need to be stirred every time you use it. hi this is definitely really easy to make but i have a question, instead of coconut oil, can i use olive oil instead? i too have dry combination sensitive skin. my face gets red really easily. I LOVE this recipe! And your directions are great. How long will it last in the container before it goes bad? Should I make a new batch every week? Every 3 months? Nora, great question. None of the ingredients are very perishable. They don’t need refrigeration. I would say three months or possibly a little longer before you need to make a new batch. Thank you for your kind words. I have always fought dry skin around my nose. I’ve been doing this for about a month now, and notice a huge difference in my skin. My make up goes on well, and my skin is glowing. 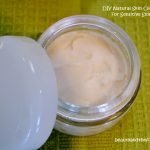 Have tried several of your DIY remedies, and they are making a huge difference in my life. Thank you for the great advice! Julia, thank you for your kind and wonderful comment! You have made me extremely happy 🙂 I have had so many problems and issues with my skin. Whenever I find something that helps my skin, I love sharing it and hope that it will help others too. Thank you for posting this recipe! I can’t wait to try this. I’m also plagued by sensitive skin — I’m a ginger living in northern Minnesota (it doesn’t get much worse than that)! I was wondering if you’ve ever looked into and/or tried adding essential oils to this (i.e. tea tree oil to help clean, lavender to help soothe, etc). Do you have any input as to whether it could be beneficial? Meli, I have many gingers and blondes in my family! I love the essential oil idea, although I’m a little allergic to lavender :(. But you could definitely put a drop or two in yours. Just be careful, some brands are very strong. Tea tree would also be fine in very small amounts, but some people hate the smell of tea tree. Feel free to add in a drop or two of your favorite oils. I have been looking for something for my very dry winter skin. My face gets very dry as does the rest of me. I am definitely going to try this and I think I will try it on my son. He has those bumps on the backs of his arms too and very sensitive skin. Thank you for the easy recipe and easy to follow directions. I will let you know how it works out for us. Thanks Megan, I too get painfully dry skin in the winter and this helps me. Hope it work for you too. Thank you so much for posting this idea. Your recipe is amazing. I have been using it for about a week now and I will never buy a cleanser for my face again!!! It was so easy to make and your instructions are simple to follow. I went to Costco for the ingredients because they have organic coconut oil, organic honey, and a huge bag of baking soda. I spent less than $35 on all and have enough to make cleanser for at least 5 years. I would have easily spent that amount on one small bottle at the beauty counter that would have lasted about a month. Everything I use makes my skin red, even the real expensive products that are made for sensitive skin. I’m excited to see the long term benefits because I know this cleanser is healing my skin. Thanks again. Christine, thank you so much for giving this a try and commenting. You have made my day!! And I was having a not so good day, so your comment turned it into a great day. Costco is a great idea, I need to get out there. I know what you mean about sensitive skin, I feel like my skin has become sensitive to most products. Love the facial cleanser/scrub! Thanks for sharing! Lisa, thank you so much for commenting. Super sweet of you!